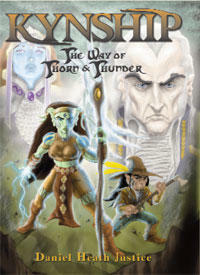 Kynship is the first book in The Way of Thorn and Thunder series by Daniel Heath Justice, published by Kegedonce Press, an Aboriginal owned and operated publisher. The Everland has been home of the forest-dwelling Kyn and the other Eld-Folk since time immemorial, a deep green world of ancient mystery and sacred shadow. The wyr-powers of the Kyn and their kith have preserved this lush region from the ravenous greed of Humanity for over a thousand years, since the catastrophic Melding that merged their world with the mortal world of Men. But the wyr powers are now under siege, for the assimilationist Kyn Shields seek to purge their people of the wyr, seeing only savagery in its mysteries and in its guardians, the Wielders. As the power of the Shields grows—and as the hungry eyes of Men turn once more to the Everland and its rich bounty—the leaders of the seven nations of the Folk gather together to seek a way of surviving the growing storm. Born into a town dominated by the Shield creeds, Tarsa, a headstrong Kyn warrior, awakens to the long-suppressed wyr-ways after an act of courage goes horribly awry. Exiled from Red Cedar Town, and struggling to understand her new calling as a Wielder, Tarsa is swept into a dangerous world of political and spiritual struggle, where the old wyr-ways clash with the fragmenting intrigues of the “civilized” Shields and their allies. As the Everland is torn apart by treachery and the ever-encroaching threat of Humanity, the Redthorn Wielder and her companions fight both flesh and spirit to heal their wounded world. Never since the Melding have the Folk faced such danger. Will their roots hold fast, or will they be lost upon the storm? First off, I appreciate the message and the discussion behind Kynship. Daniel Heath Justice is a Cherokee author and wrote Kynship as a loose allegory for the Trail of Tears, the expulsion of Native American people from the southeastern USA in the 1800s. Also, using native tradition of subverting gender and the belief in a third gender, Justice makes an interesting statement about what is considered “normal” for the Everland Folk compared to Men. We also discussed the binary of “savage” versus “civilized” society. However, I have to be honest, if I didn’t have to read it for class, I probably wouldn’t have picked it up, much less finished it. As a designer, I had aesthetic issues with it from a publishing standpoint. The typeface is serif but a little too fancy, the leading is too small, and there are next to no margins (whitespace) around the text area—which all detracts from the ease of reading. But as for the content, I just found the story long-winded, directionless, and (most of all) there was too much telling instead of showing. I read that Justice wrote it as a single story but it was split into three volumes for easier consumption. Unfortunately I don’t think they reworked the telling of the story to reflect this setup because Kynship ends with no real conclusion and with the main character (Tarsa) recently departed on a quest. In my opinion, it would be more useful for them to end just as Tarsa is about to leave, thus creating a more compelling cliffhanger between installments in the series. Overall, I can appreciate the intent of Kynship, but it was not overly exciting for me. The issues that Daniel Heath Justice raises are excellent for discussion, but it just wasn’t compelling from a reader standpoint. There were some interesting characters developed and I would be curious to hear more about Quill and Tobi, but wasn’t particularly fussed about anyone else.